On 4/20/15 I met Drew and Chrome rust for dinner in Santa Ana and Chrome gave me a Veromessor pergandei queen. She had 4 nanitics, a few larvae and what looked like a small bunch of eggs. 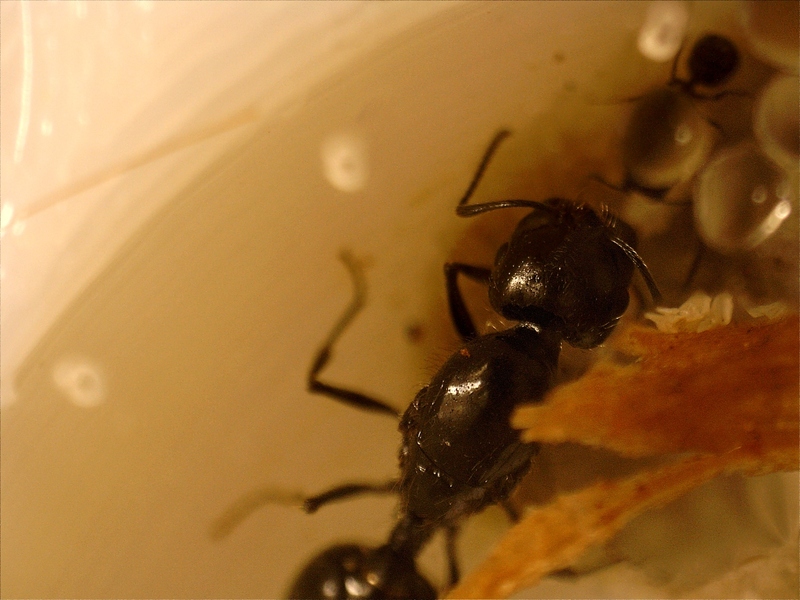 On 4/23/15 I put their test tube in the world portion of a Biformica growth chamber that I used to have a colony of D. Bicolor in. The two dead queens were still in the nest. 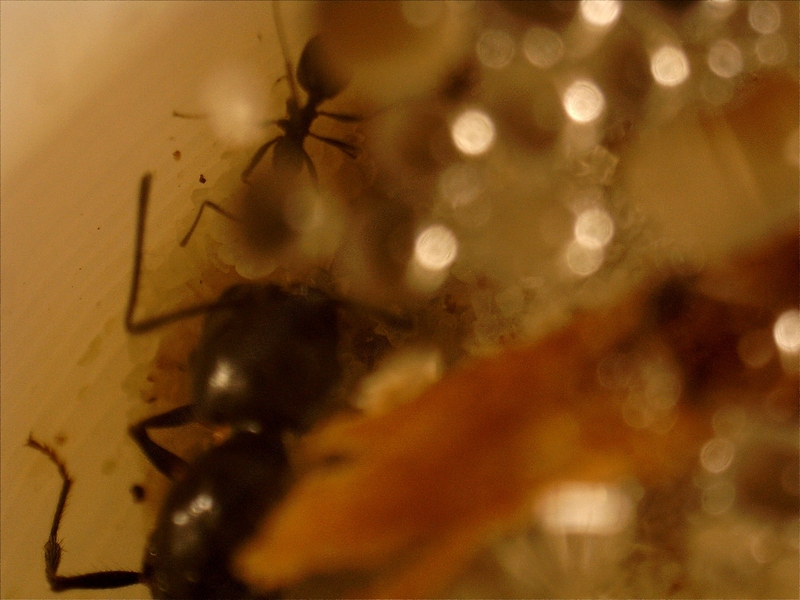 Within 24 hours the queen had moved into the nest and moved the two dead queens into the outworld so I could clean them out but as of today the nanitics and brood are still in the test tube. Feel free to just dump them out. That's what I do. My wife forced me to. She was walking past them and knocked the test tube over, breaking it. all of the workers were out and running free. I saved all four of them and put them into the outworld of the growth chamber. I saved as much of the brood as I could, but I'm not sure I got it all. I can't see what is cotton and what is brood (my eyes are starting to go bad). I saved as much brood as I could, and now they are officially in the growth chamber and not in a test tube. It could have been worse I guess. Women, can't live with them, can't live without em' lol. Can't live with them, can't kill them.... lol. But you have to admit that most women are as tolerant of guys as most of the guys are of the gals. Don't get me wrong Crystals, I really really like women, as long as I'm not married to them, lol. I remember a guy once telling me that he refused to get married because he was scared of commitment. Then his mother piped up, "what do you mean? You have a 30 year house mortgage and an 8 year car loan...."
But it is a huge commitment. I will stop hi-jacking your thread. I assume your ants settled right in? Are they foraging? I don't mind being committed to someone. The problem with marriage is that you are financially tied to a person who can decide they intend to quit anytime they want, or use your finances or your children to try to hold you hostage, and the laws tend to favor the female side of the table in those situations. It's frustrating. I'm certain I'll never marry again. Yes my ants settled in. They are caring for the brood we adopted for them, and they seem to be foraging, although they haven't taken any food just yet. They seem to be doing really well in the founding chamber by ByFormica. I was so excited to see she had laid some eggs!! Nice big pile of eggs. It's hard to see them because of the condensation, but if you look real hard you can see them. Condensation means there is moist air in the formicarium, and also that the temperature outside the formicarium is lower than the temperature inside. 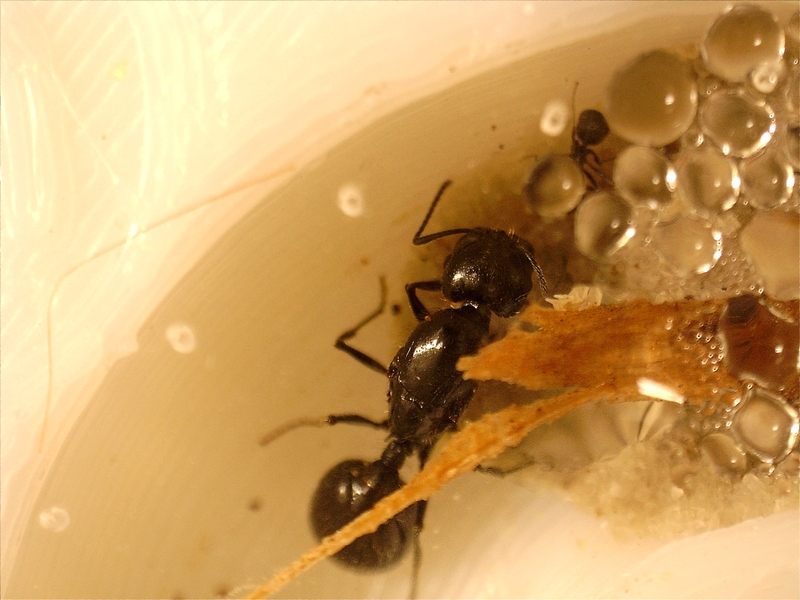 This can be caused by sudden temperature changes, placing the formicarium near a drafty area or cooling vent, or if heat is coming from the bottom of the formicarium, such as if placed on a heat pad, laptop, or other electronics. Moving the formicarium to a warmer area free of drafts, and placing on a non-heated surface, will completely eliminate any condensation issues. I realize I'm causing the condensation, I don't think I have any choice. I keep part of the formicaia on a heat cable so they can be warm enough, and so there is a range of temperatures inside so they can find the right temperature for themselves. I have one end of the formicia on the heat cable, and the other end is cool. My home stays so cool that's the only way I can think of to keep them warm enough. True. In that case, condensation is unavoidable. Maybe one day I'll get around to making my transparent incubator box for ants that will solve the problem universally and affordably. I just saw my typo in my previous post. Good thing I didn't post that on that other ant forum, lol.